Three Filipino boxers were slated to fought in Rex Tso vs Ryuto Maekawa undercard yesterday October 8, 2016 at Convention Towers and Exhibition Center, Hong Kong S.A.R., China. Jay Solmiano of San Andres, Catanduanes, Philippines knocks out his hard-hitting Thailander opponent Chaloemporn Sawatsuk. Solmiano scored a knockdown in the very 1st round of the fight, Solmiano connects a hard body shot straight to the abdomen of his Thai opponent, Sawatsuk down and was badly hurt. Solmiano improved his record to 18W(15KO)-3L. Meanwhile, Rey Megrino wins his fight by a one punch KO against Jason Butar-butar of Indonesia. 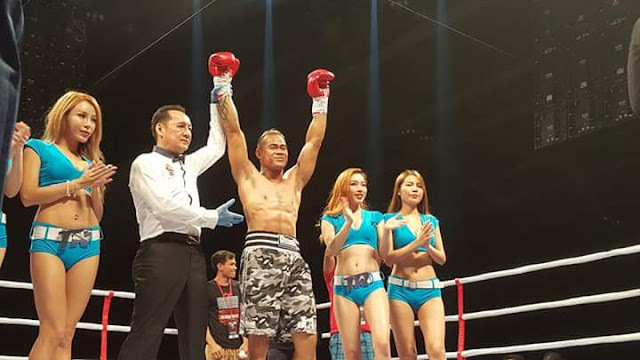 Butar-Butar was down in the 5th round and counted out by the referee at 52 seconds left in the fight. Megrino continues his winning streak by 9. Unfortunately, Filipino Jerope Mercado was defeated by the undefeated Paul Fleming of Australia. Fleming knocks out Mercado in the 2nd round to improved is impressive record to 23W(15KO)-0L.